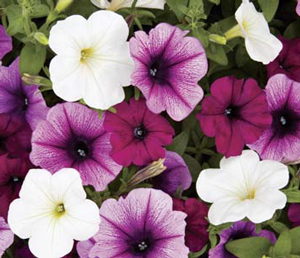 Our ‘Sanguna Sangria’ Combination combines the rich, velvety burgundy Sanguna petunia with the vivid burgundy venation and burgundy-black throat of the Sanguna Plum Vein petunia, with the starkly contrasting, but wholly necessary White Pearl! A delicious mix! The plants in our 'Sanguna Sangria' plants are grown and shipped in fine quality growing medium and are guaranteed to arrive alive and ready to thrive.